Wooden swords can be deadly, and you see them used here in this movie version above of a fight. 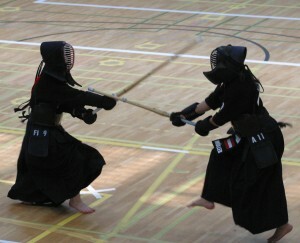 Real kendo matches are nothing like this. I have included a super high-speed, slow-motion clip that shows the winner might be 0.009 second faster than the loser. I can’t grasp how the judges see these slight differences. It doesn’t appear they need to look at a replay.